The RN Francesco Caracciolo was to only Italian WWI super dreadnought to be launched on 12 May 1915 at Castellamare di Stabia. The original project called for a 35,000 tons BB, a speed of 28 knots, 12/381 in triples and 20 152 mm in casemates: at any affect, the first fast battleship. The projects were presented by Ansaldo (eng. Soliani), Orlando (end. Orlando) and Odero (eng. Scribanti). 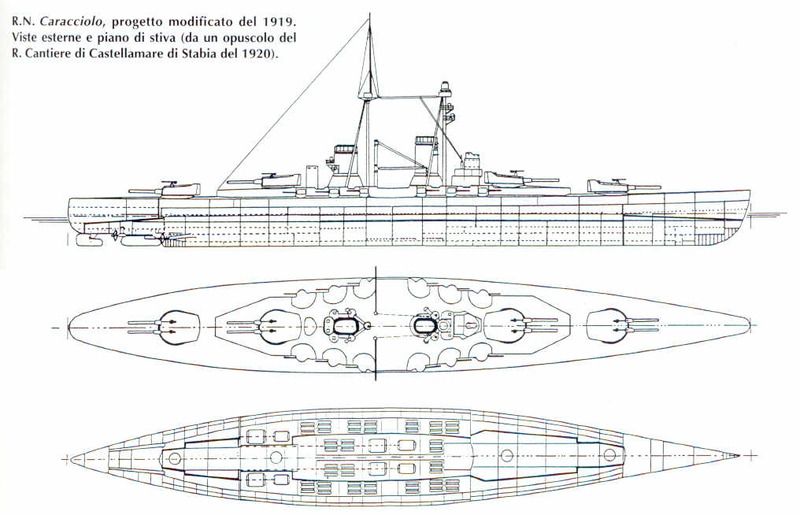 The Regia Marina presente designs by General (NC) Ferrati and Carpi and colonels (NC) Rota and Russo. General Ferrati was in charge to find the best overall design. Since the beginning, the requirements lowered to 8/381 and to 31,000 tons. 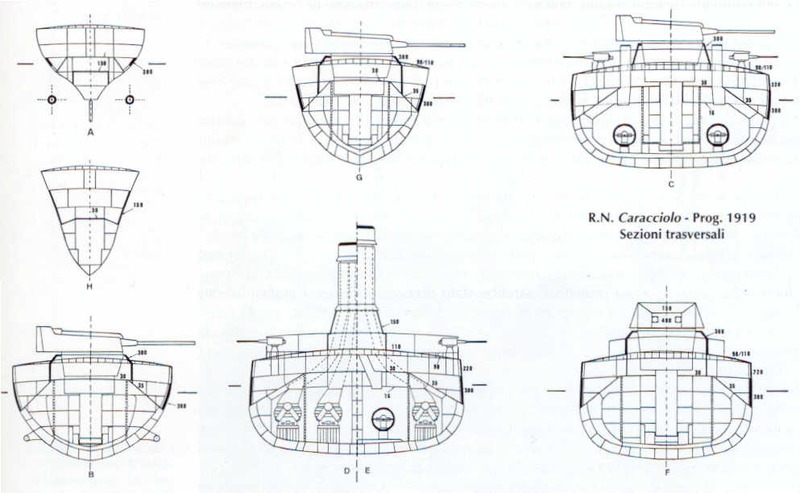 Freude tank experiences were conducted in La Spezia to identify the best hull forms, and scale models were use to test the best underwater protection. Venica arsenal was in charge to test the horizontal protection and again La Spezia responsible for the oil boilers and the connected pipes. An additional protection was added to the bow section, 2 level, high, 150 mm thick. Displacement rose to 31,400 tons, even if 4/6 152 guns were removed and the 76 mm. guns replace with the lighter Vicker 40/39 mm). The four BBs were started, but given the war priorities suspended in 1916, with the exception of the RN Caracciolo: her hull was launched on 21 May 1920. The other three were scrapped on the slipway. In the meanwhile, the war experience showed the importance of a good TDS defence; the designed one was revised, adopting a joint Royal Navy / Regia Marina solution derived from experiences conducted on old, dismissed hulls. This solution was far worse than what was adopted by the Kaiserliche Marine, which contacted a large range of simulation, each time verifying the effects of the explosion on the 1:1 hull mock ups. The Jutland/Skagerrak experiences of the long range fire on the insufficient horizontal protection led to a further revision of the design, even if, given the advancement of the hull, forced to foresee the adding of armour (90-110 mm) directly over the weather deck, enhancing the usual curved shape, while the barbettes where increased up to 400 mm. The new protected deck was supposed to weight on the lateral protection, organised in 300+220 mm thickness. The TDS remained insufficient. 20 Yarrow boilers, 4 Parsons turbine, 4 shafts, 70.000 HP (25 k.) 105.000 HP (28) k.
Range 8,0000 miles with 1,800 oil tons. The project was anyway abandoned given the number of compromises and the evidences rising from the new heavy units construction cycle. 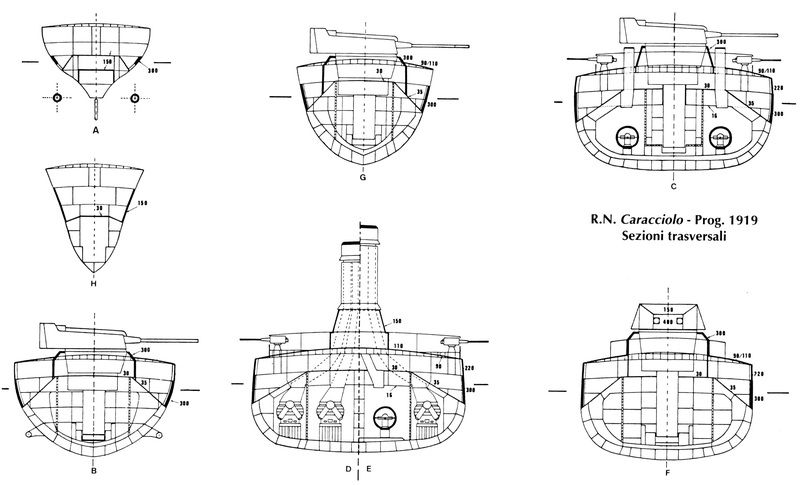 Studies for a conversion of the hull in a merchant unit and in an aircraft carrier were drawn (see the related articles in the blog). Source: Le navi da battaglia classe “Caracciolo”, A Mascolo, Storia Militare. It would certainly have been interesting if they had been completed. I wonder if having the Caracciolos in the fleet would’ve meant that the Andrea Doria and Caio Duilio wouldn’t have gotten rebuilt and instead the Caracciolos would’ve been rebuilt themselves. Probably. But the point is there was no money, and while the dreadnought were more or less comparable to the French ones, the was no modern cruiser, and French navy started hers in 1922. The drawings seem to show no armor on the face or roof of the 152mm casemates in the 1919 design. Is that correct? Actually it seems the contrary, with armour added on top of the 152 gun areas. I can’t see any armor values for those areas. The added 110 mm deck armor looks like it is below the 152 mm guns and the 220 mm upper belt ends below the casemate.